Whether you’re snapping off bites, peeling them apart, or classing them up with a glass of champagne (it’s a thing), you can always make room for a few facts about Twizzlers. There might even something for you, Red Vines devotees. 1. THEY WERE INVENTED BY ONE OF AMERICA’S OLDEST CANDY COMPANIES. The history of Twizzlers stretches all the way back to before the Civil War. In 1845, the Young & Smylie firm set up shop in Brooklyn and began making licorice candies—everything from licorice root to lozenges to 5-pound tins of licorice pellets. In 1902, Y&S Candies, as it was known by then, merged with two other companies to form the National Licorice Company (it adopted the Y&S Candies name in 1968). In 1929, the company came out with Twizzlers, which weren’t available mainstream until the '60s. In 1977, Hershey’s bought Y&S Candies and molded Twizzlers into the soft, twisty brand it is today. 2. ONLY ONE FLAVOR CONTAINS ACTUAL LICORICE. Shocking, we know: Despite Hershey’s calling them “licorice candy” (though not on packaging, mind you), Twizzlers are mostly absent that main ingredient. Instead, they’re made primarily with corn syrup, enriched wheat flour and artificial flavoring. Only the black licorice flavor contains licorice extract. From a health perspective, that may be a good thing, as the Food and Drug Administration once warned consumers about the dangers of eating too much licorice. From a taste perspective—well, nobody likes licorice candy, anyway. 3. THE RED VINES VS. TWIZZLERS FEUD IS PARTICULARLY NASTY. North vs. South. Republican vs. Democrat. Red Vines vs. Twizzlers. Even though they’re made from essentially the same ingredients, both brands have fiercely loyal followings that tend to think the other side is completely nuts. You’re for either one or the other; you cannot be for both. A geographic divide between the west coast roots of Red Vines and the east coast beginnings of Twizzlers may account for some of the animosity. It also seems to be a matter of which brand people grew up eating. As each side lobs insults like “waxy,” “flavorless,” “disgusting” and “OMG what is wrong with you? !” at the other, America descends further into chaos. 4. THEY PLAYED A BIG ROLE IN THE IRAN NEGOTIATIONS. It turns out America’s best foreign policy minds have the eating habits of a college senior cramming for midterms. Over the course of a month during this year’s tense nuclear talks with Iran, the American diplomatic team consumed 10 pounds of strawberry Twizzlers, along with 20 pounds of string cheese and more than 200 Rice Krispies treats. No word on whether their moms also sent them cases of Arizona Iced Tea to wash it all down. 5. THEY’RE HUGE IN UTAH. Hershey’s recently did some retail recon and found that Utah residents consume candy at twice the national rate. And Twizzlers are a favorite choice. The reason: More than 60 percent of the state is Mormon. “We don’t drink alcohol, we don’t smoke, we avoid coffee—but we certainly do sugar,” one resident told Bloomberg News. Utah also has a lot of kids, with 31 percent of the population under the age of 18, compared to the 23% national average. 6. IN SOUTH KOREA, NOT SO MUCH. Huffington Post UK ran an amusing taste test that subjected South Koreans to American junk food. To them, eating Twizzlers amounted to eating rubber, and one of them wondered if the candy was “something that grandmas eat to practice chewing.” Ouch. Still, that’s not as bad as the criticism reserved for Pop Tarts (“It tastes like a candle”) and Goldfish (“It kind of feels like I’m eating belly fat”). They’re part of Floyd Mayweather’s pre-fight diet, and U.S. women’s soccer star Sydney Leroux has a thing for them, too. They’re also a favorite with long-distance runners as a quick source of energy. 8. 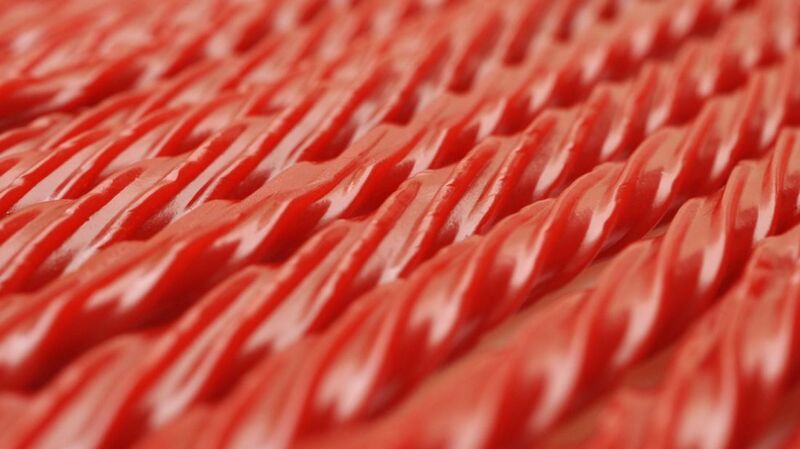 HERSHEY’S MAKES ONE MILLION MILES OF TWIZZLERS EVERY YEAR. That’s enough to circle the globe 40 times and still have room to stretch across America.